Paul - it's only taken 10 years! The regiment doesn't have any obvious local connection but fortunately his service record survived. James Bennet – age 26 – Lance Corporal (36507) 11th Battalion (2nd Hull) East Yorkshire Regiment. James was a draper living at 1 Maybank Street, Crosshill, Glasgow when he enlisted as Private (16327) in the Highland Light Infantry in November 1914. He was posted as Private (9315) to the 32nd Division's Cyclist Company of the Army Cyclist Corps in September 1915 and landed with the Division in France in November 1915. He was wounded on the 1 July 1916 and evacuated to hospital in England. He returned to France in December 1916 and was posted to the East Yorkshire Regiment. Born 1891 in Glencairn. 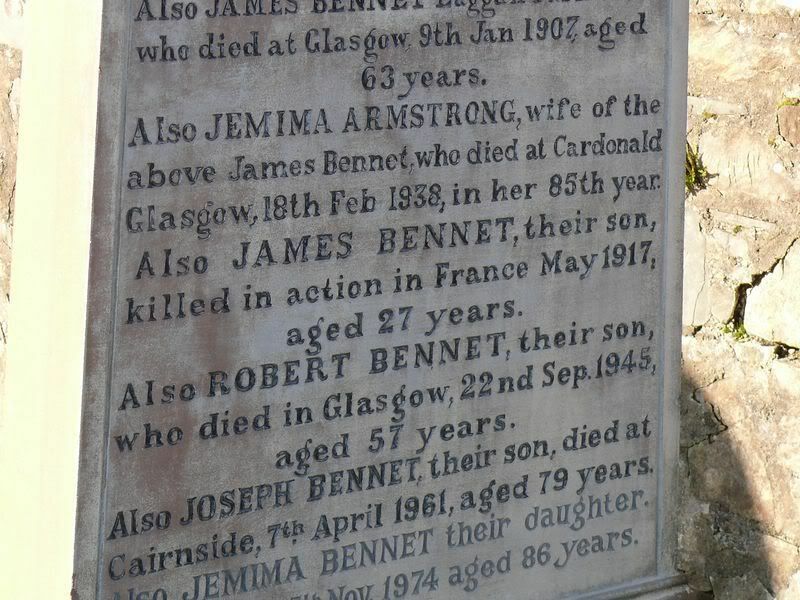 Son of the late James Bennet of Lagganhill, Glencairn and of Jemima (Armstrong) Bennet of 1 Maybank Street, Crosshill, Glasgow. Donald McDonald – age 28 – Petty Officer (Clyde Z/2016) Nelson Battalion, Royal Naval Division, Royal Naval Volunteer Reserve. Donald was educated at Dumfries Academy before becoming a merchant seaman. He was awarded his Second Mate Certificate in September 1906. He enlisted in November 1914 and was initially posted as a Chief Petty Officer to Mudros on the Greek island of Lemnos in February 1916. He reverted to P.O. in May 1916 before he joined the Nelson Battalion in France in June 1916. Donald's remains were recovered from the battlefield and he was re-interred at Cayeux after the war. Killed in Action on 13 November 1916 and buried in Cayeux Military Cemetery, Somme, France. The Army Registers of Soldiers effects gives his date of death as "on or since 3 July" and this is the date that CWGC use. 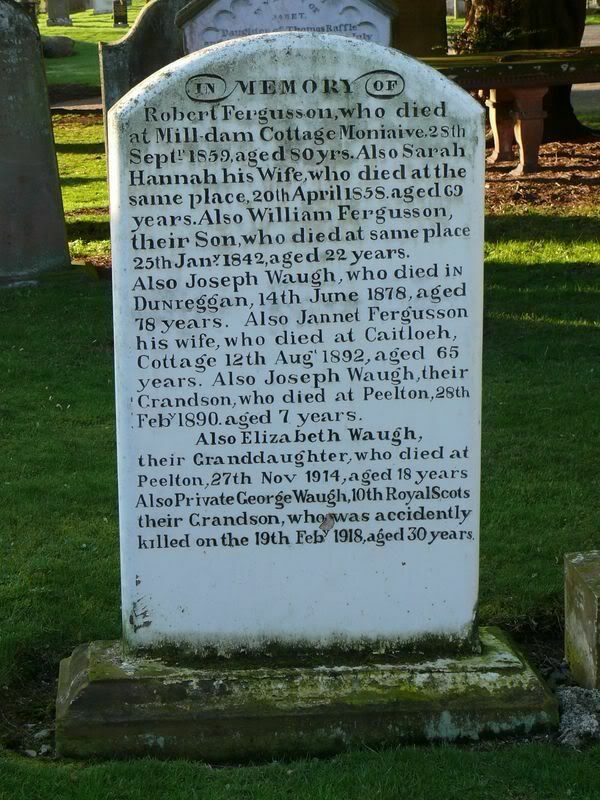 Maybe the family got information later which gave the date of 16th? Also interesting that his birth mother is not mentioned. John had worked at Woodhead, Auldgirth, Dumfriesshire before he joined the Glasgow Corporation Tramways in 1911. He was living in 1071 Pollokshaws Road and was employed at the Newlands Depot when he enlisted in 1914. He landed with his battalion at Boulogne in November 1915. Born 1891 in Keir, Dumfriesshire. 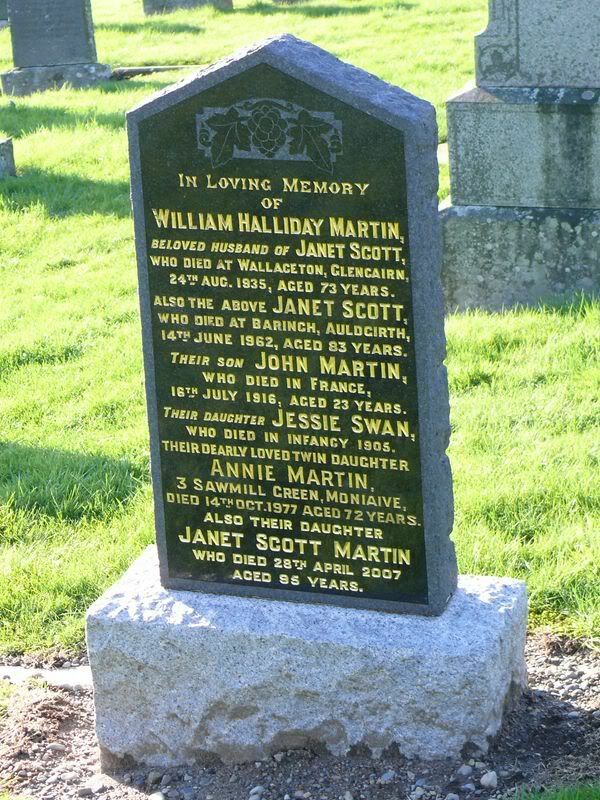 Son of the late Agnes Helen (McKie) Martin (died 1895) and of William Halliday Martin, and step-son of Janet (Scott) Martin, of Snaid Mill Crossing and of Wallaceton, Glencairn who had married in 1899 in Ruthwell, Dumfriesshire. Missing in Action on 3 July 1916 and named on the Thiepval Memorial to the Missing of the Somme, France. 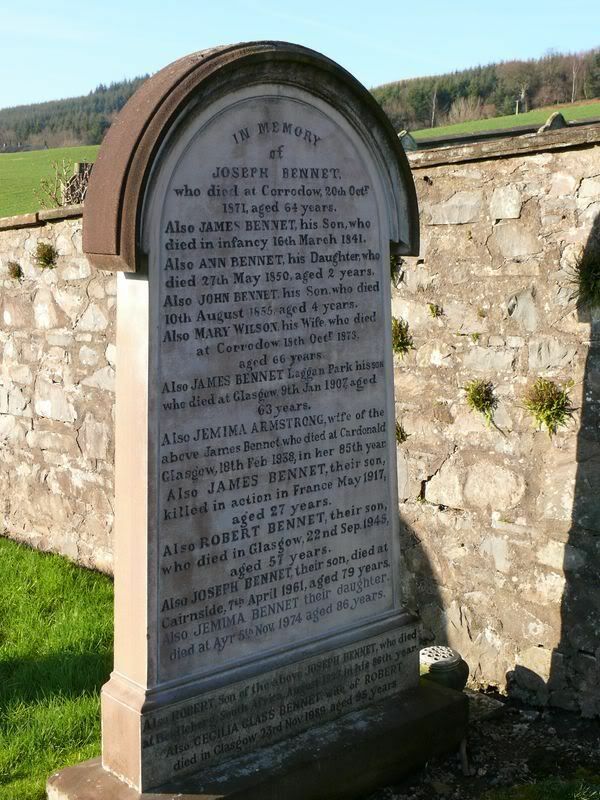 Also named on the Glasgow Roll of Honour and on the GCT Newlands Depot memorial. Fortunately his service record survives and explains the reference to the 10th Royal Scots and to the cause of his death. 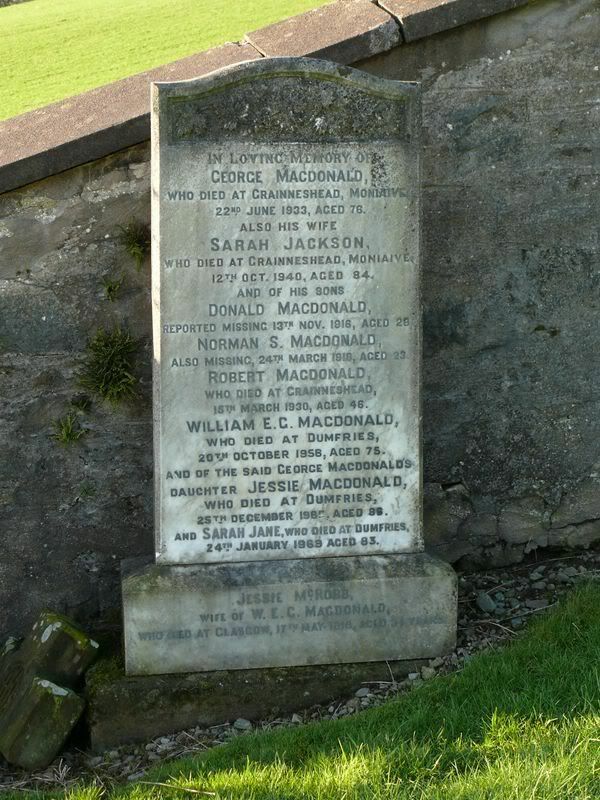 George was a gardener Crawfordton House, Moniaive when he enlisted in January 1916. He was mobilised in November and as Private (29978) he was posted to the 1/7th Cameronians in Egypt in March 1917 but by May he had been evacuated home after contracting blood poisoning and having his right fore-finger amputated. He was posted to the 1/10th Royal Scots in August but by January 1918 he had been transferred to the 460th Agricultural Company of the Labour Corps and was employed on forestry work on the Crawfordton Estate by Captain Laurie Walker. George was accidentally killed by a falling tree near the Home Farm.